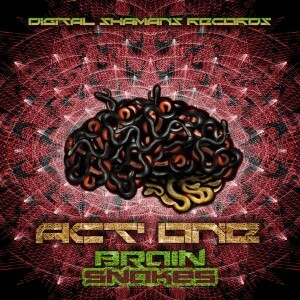 Digital Shamans Records is pleased to bring you Brain Snakes, a fresh collection of storming twilight sounds from Act One (Jack Allsopp), a young producer from the northern hills of England. At the age of 20 he has already blasted these tunes around Europe and has enjoyed support from some of the big boys in the scene. Expect groovy bass lines, big leads, and lots of lovely glitch effects! Mastered by EVP with cover design by Super Hero Studios. MP3 Download | FLAC Download | WAV Download · Download count: 6,957. 20 years old? This is an excellent EP, I can say all the tracks are keepers Ide play out. For only someone who is 20, you have either gotten into the psy scene at a young age and started producing…..Or maybe you really are just that good. Looking forward to all future works. BOOM! Snakes on a Plane!! Just kidding, this album is waaaayyy better than that crappy movie! This work of art is thumping, pumping and well-orchestrated. Good work, Act One! Gotta hear more of your stuff! Cheers!! Keep up the continuous groovy uncompromising bassline! SWEET SNAKES! What an EP! Dig that crazy energy! Wow! Seriously some top shelf tunes bro! Track #3 seriously is nuking futs! This is amazing, one of the best twilight style releases to be found on Ektoplazm. Top notch mastering by EVP. ^^ WOw I had not realized I had already commented on this! Well HOORAY again for rediscovery!